It’s been about three days since my last spanking with the razor strop and my bottom’s no longer tender or marked. Which is a real shame since it left such a delicious tenderness and some interesting marks. It’s quite an impressive implement! I don’t think I mentioned it’s dimensions earlier and I should have since it’s a toy to be respected. It measures 23″ long and 2 1/2″ wide and is made up of two heavy leather straps. Those are the ends of the straps in the picture above. Both straps are thick sturdy lengths of leather so combined they are quite a force to be reckoned with…and quite the spanking tool. Have I mentioned my bottom was tender for two whole days??? I’m sorry but for my bottom, that’s quite an accomplishment. I don’t know if it’s all the years of spanking, but my bottom is incredibly resilient. Dan has quite a time getting it to mark at all and even then, the marks often fade by the next morning. I might even be a little tender the next morning, but even that goes away fairly quickly. I hate to admit it, but I think I have a tough bottom. That’s why having tenderness for two whole days after a spanking is quite an accomplishment and why I am so enamored of that razor strop. I’ve spent the last couple of days applying leather treatment to the straps at Dan’s suggestion. I’d conditioned it a little before we used it but it really needed more. It’s an older strop that hasn’t been treated in years probably so if we’re going to be using it, it needs some serious mosturizing. I wonder if it’s because I’m such a greedy spanko that I could take such pleasure from preparing an implement so I can be spanked with it again and again. As I rub the treatment into those leather straps I’m reminded how much it burned as it was applied to my bottom. I remember how the straps left weals that burned so much that later when Dan made love to me and my bottom was being pushed down onto our bed, it felt like lines of fire were being applied to my bottom. At one point I thought something hot must surely have been slipped under me because there was no way that burning sensation was just from my spanking. But it really was just the welts that were burning so much. 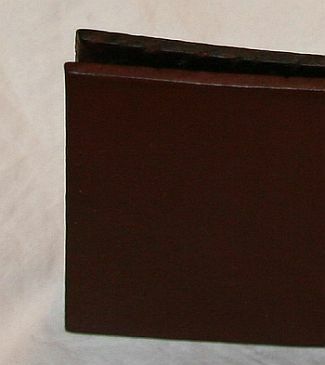 Even as I remember those sensations, I carefully finish the leather treatment and then return the strop to its new home on a nail on our bedroom wall. I run my hand one last time across the leather and leave it there for the next time. I never knew tending to my toys could be so enjoyable. WOW! Two whole days? I must not be getting spanked hard enough! I’ve never felt it for more than about 5 hours. I envy you!!!! 🙂 I’d love to have that warm tender feeling for two days! Maybe I have a tough tush? I don’t think I get spanked often enough to build up resistance. Do you think that exercise toughens it up too? Because unfortunately with my “diet regimine” I am excercising more….. I love leather!! Where can someone like me find a great strop?? I often don’t feel the effects the next day either. I rather like the lingering effects of a good spanking.